The top pick in Calgary for moving junk removal. Why Is YYC Junk Removal the Best Choice for My Move? We take our jobs seriously. 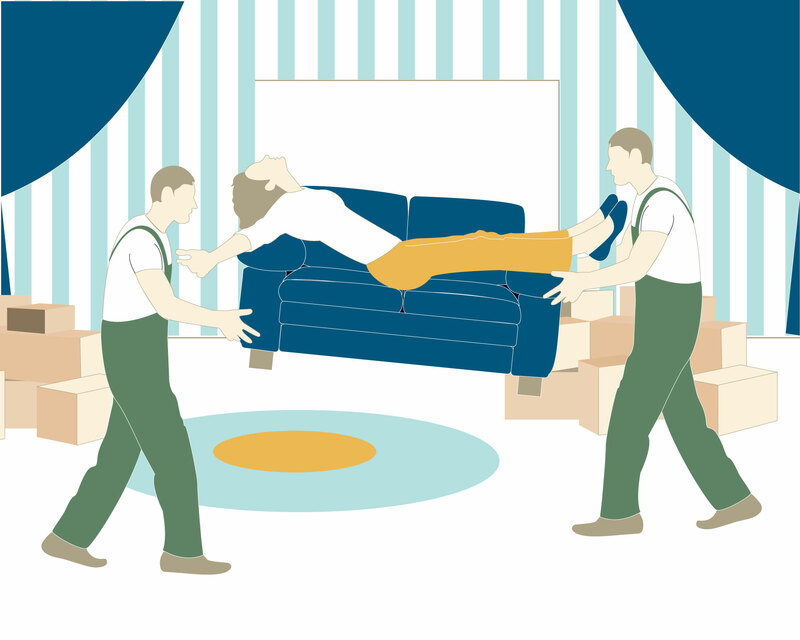 Scheduling multiple appointments with realtors, lawyers, and movers can take a lot of juggling. Without a doubt, with so much going on, things absolutely must be done on schedule. Completely professional in our dealings, YYC Junk will not miss your appointment, saving you from further hassle and even potential financial penalties. You already have enough to deal with! Leave the junk to us. Know that diverting from the landfill and re-homing your old stuff comes first in our process. YYC Junk exists to remove the pressure of dealing with excess furniture and other items. We understand that you have enough to do. Save your energy for packing and moving the things you really want in your life. Needless to say, preparing for a move takes a lot of energy. It’s a full time job. Packing, arranging appointment times, completing household repairs, making your home spotlessly clean, choosing what stays and what goes- the list goes on. Not to mention you still have your real full-time job to go to! Let us deal with the things you no longer want. A move can be a fresh beginning, so why not start out on the right foot? Take a few seconds, close your eyes and picture your new place. What do you see? A tidy, clean, orderly space that makes you feel comfortable and relaxed? Now open your eyes again and gaze upon all of the clutter you’re holding onto that you’ve always wanted to get rid of. No way you’re keeping all that, right? 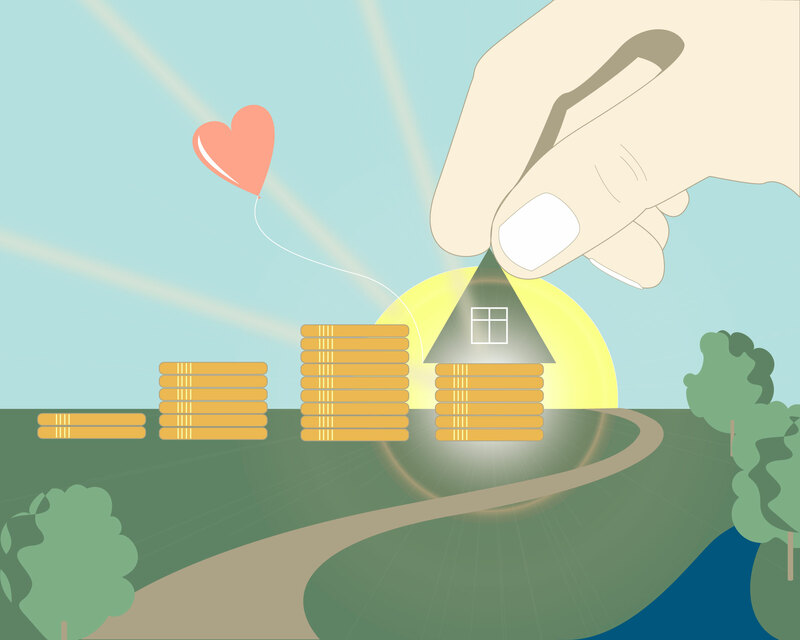 Why Spend Money Moving Things You Don’t Want? Don’t pay to move stuff you don’t want, need, or use. Your new home would probably be a little bit nicer if it didn’t have your old junk in it. 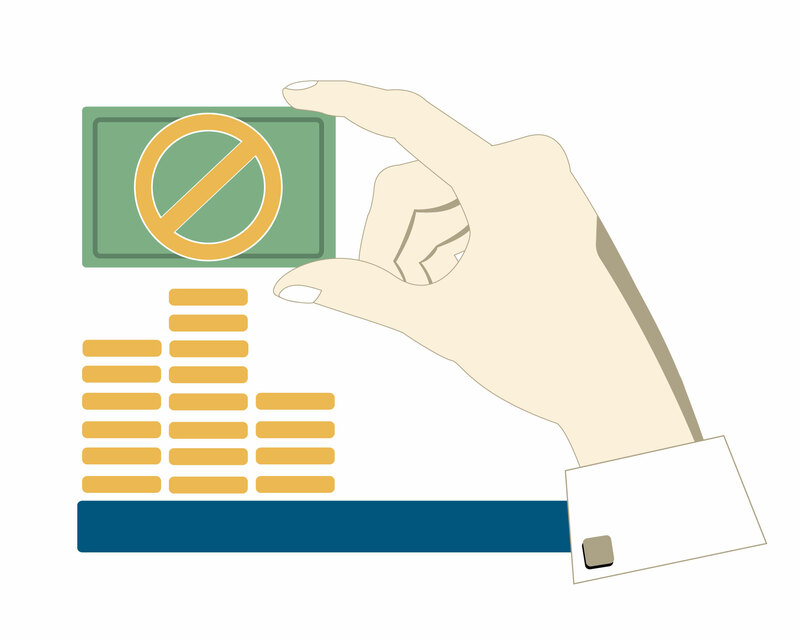 Get rid of unwanted items, and use the savings to buy new stuff that you actually like. YYC Junk handles the lifting, loading, diversion, donating, and recycling so you can get on with your day. Best of all, you can feel good knowing that you old stuff gets to be new stuff to someone else. Do you still have boxes of junk from last time you moved? Curiously enough, this is extremely common. If we had to guess, we would say that more than half of people have boxes they never even bothered to open after their last move. Moving can generate a lot of unwanted items. Our larger style of trucks allow us to fit twice as much junk as our competition. This means we can do twice as many smaller jobs before unloading, and we can do larger jobs with half as many trips. In short, we only have to unload half as often as other companies, saving substantially on time, labour, and fuel. The less stuff you have, the easier the move. Obviously getting junk out of the way sooner rather than later save you from an enormous headache down the road. Being done with the “should it go?” part of your move means you can focus on the rest. Ridding yourself of the excess and the clutter first allows you to focus your energy on the other steps. We always use trucks with enclosed backs to ensure items that can be donated are not destroyed by weather. Come rain, snow, hail, or whatever else nature throws at us, your items will stay safe. YYC Junk sorts out donations and recyclable items rather than indiscriminately dumping everything into the landfill. In fact, our crews remove so many items from our loads to the dump, we do not need the use of a hydraulic dumping mechanism, saving weight, space, and fuel. Seeing how other companies treated people’s loved ones items is what inspired us to be different in the first place. When we first started out, we watched a different company smash an entire truck worth of a recently deceased person’s furniture into smithereens right out front of a seniors home, in front of all the residents. As a result of that appalling moment, specializing in repurposing became a huge priority for our company, not to mention a big part of our estate cleanout Calgary. With our two levels of service, we provide options to make sure your pre-move junk removal goes effortlessly. We know that people have different needs when approaching a move. Hemming and hawing over what to keep and what to throw away? Hire our crew hourly to help sort, advise, clean, and even move items around for you. Classic service option: our crew lifts and loads furniture and household goods you have bagged and tagged for them. 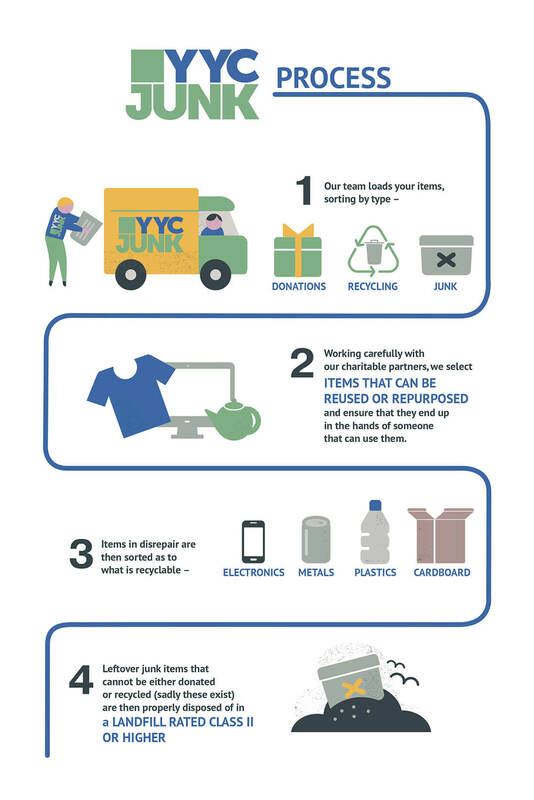 YYC Junk ensures donations, recyclables, and trash all go to their appropriate places. Enhanced full-service pre-move junk removal: your own exclusive two person junk liquidation team arrives to aid in stay-go decision making, furniture repositioning, remove surplus stuff, and put things into bags and moving boxes. Going through your belongings with you, we use our knowledge and experience to minimize any uneasiness over what you discard and what you decide to keep. As you might expect, our team has done this on countless occasions in many different situations. 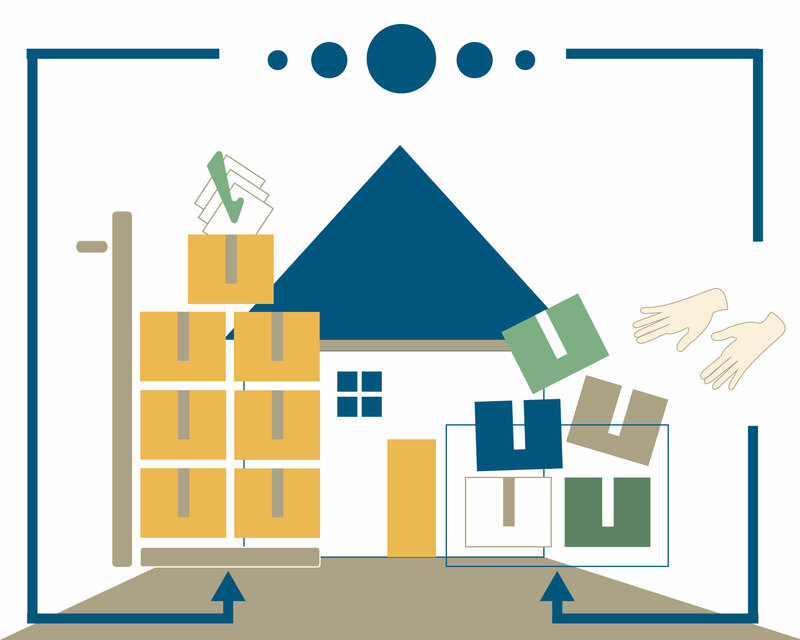 Make the process less painful by using our help to decide, sort, organize, and toss. What happens to my stuff when the crew arrives? How Do I Book My Moving Junk Removal? Arrange your moving junk removal the fast and simple way. Give us a ring at 403-829-1958 or book online. Our junk removal consultants will be happy to answer any questions you might have and even set up an appointment. We take almost anything from basic household odds and ends, large furniture pieces, leftover renovation materials, or even debris from tidying up the garden. Our team will provide a no-obligation estimate on-site for your moving junk removal, and if the price sounds right to you, wave goodbye to your trash! After consulting with you, we will make sure to divert, re-purpose, and recycle everything possible from your moving junk removal. With the increasing amount of trash going into our city landfills each day being at the forefront of our minds, we constantly strive to reduce our impact on the environment.